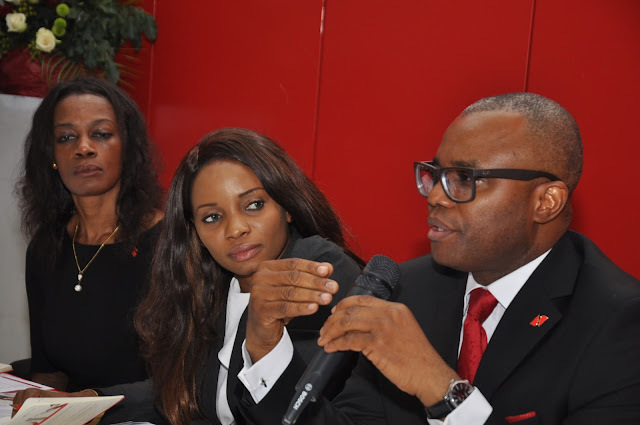 UBA Foundation, the corporate social responsibility arm of United Bank for Africa (UBA) Plc , has announced the opening of entries for the 2015 edition of its annual National Essay Competition. Ijeoma Aso, the Managing Director/CEO of UBA Foundation, at a media briefing held at the UBA Head Office in Lagos, on Wednesday, September 30, 2015, announced that the Foundation will start receiving entries from eligible participants in senior secondary schools in Nigeria. The briefing was attended by students from different secondary schools in Lagos. Speaking during the media briefing, Ms Aso, said the essay competition provides an opportunity for students in senior secondary schools in Nigeria to win prizes in the form of educational grants. 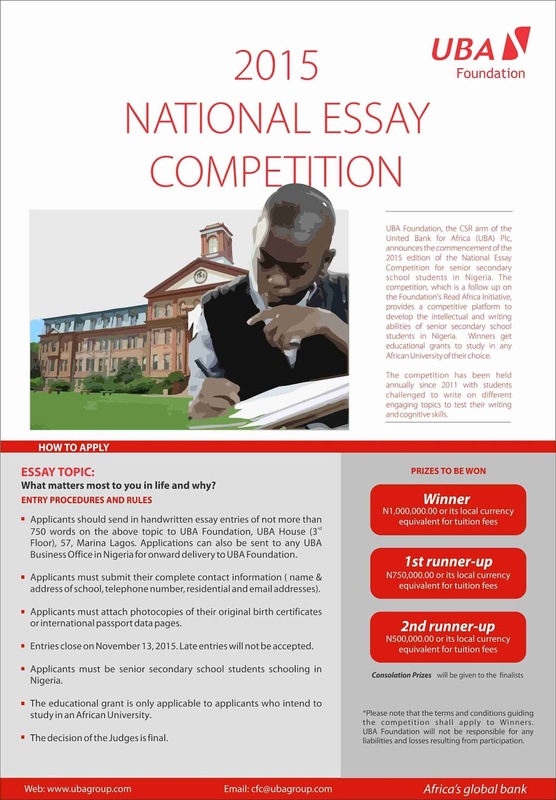 The first prize for the UBA National Essay Competition is a N1 million educational grant for the winner to study in any African university of his or her choice. The second and third prizes are N750,000 and N500,000 educational grants respectively. Ms Aso explained that the competition is part of the Foundation's initiative to promote creative and analytical thinking in senior secondary students in Nigeria and is a follow up on the Foundation’s Read Africa initiative, which promotes reading culture among students through the reading and free distribution of Africa literary classics in secondary schools. The national essay competition is also held Ghana and Senegal. 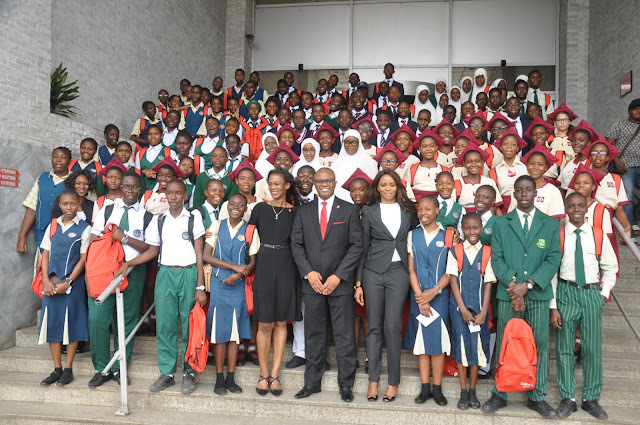 Managing Director/CEO, UBA Foundation, Ms Ijeoma Aso; Deputy CEO, UBA Africa, Mr. Emeke Iweriebor; Director, Marketing and Corporate Relations, UBA Africa, Mrs Bola Atta, with students of secondary schools, during the launch of the 2015 edition of National Essay Competition for Senior Secondary School students in Nigeria, organised by UBA Foundation, held at UBA House in Lagos on Wednesday. Entries received for the competition will be reviewed by a distinguished panel of judges made up of professors from reputable Nigerian Universities, who will then shortlist 12 best essays for further assessment. A second round of the competition will involve the 12 finalist who will write a second supervised essay from which three best essays will be selected. “Three best essays will be selected as the overall winners from 12 finalists that will emerge from the first round of the competition.” Said Ijeoma Aso, Managing Director/CEO, UBA Foundation. The top three winners of the competition win educational grants to study in any African university of their choice. The Group Managing Director and CEO, UBA Plc, Mr. Phillips Oduoza, represented by Mr. Emeke Iweriebor, Deputy CEO, UBA Africa, said the essay competition is UBA’s modest contribution to educational development in Nigeria and across Africa. He urged students to take the national essay competition seriously as it provides a massive opportunity for them to change their lives for the better. He also dared students to dream big and read and write extensively. “Great leaders are people who read. They read everything that they come across. They have a curious mind so they study hard” Mr. Iweriebor said. Also speaking at the media briefing, Bola Atta, Director- UBA Africa, Marketing and Corporate Communications, urged students to see the national essay competition as a opportunity to lay a foundation for success in the future. l-r: Director, Marketing and Corporate Relations, UBA Africa, Mrs Bola Atta; MD/CEO, UBA Foundation, Ms Ijeoma Aso; and Deputy CEO, UBA Africa, Mr. Emeke Iweriebor, during the launch of the 2015 edition of National Essay Competition for Senior Secondary School students in Nigeria, organised by UBA Foundation, held at UBA House in Lagos. “You have an amazing world ahead of you. You can be all that you want to be. By reading, you get ideas and you can imagine whatever you want to be. The mind has a way to channel your energy into whatever you want to become in future” she said. She also urged the students to read far and wide and that no information gained from reading is wasted. As the Corporate Social Responsibility arm of the UBA Group, UBA Foundation is committed to the socio-economic betterment of the communities in which UBA operates, focusing on development in the areas of Environment, Education, Economic Empowerment and Special Projects.